Used this double to align finder scopes tonight. Something more interesting than a bright star. M13 appears in the finder as a faint blur. It is centered in the finder just as nHerc reaches the edge. At low power (32mm) M13 is a gray blur that resolves into a grainy patch with averted vision. The best focus for averted vision was HIP81848 up and to the right of M13 in the field of view. There is a rich field of background stars that set off the patch of M13 nicely. Medium power (13mm) brings out individual stars around the edges of the cluster. The stars form gently curving arcs with gaps between. The center remains a glow, but now with surface irregularities suggesting structure within. Filed stars are now dimmer than the cluster and the cluster dominates the field of view. With high power (9mm) the cluster fills the field of view. There is an amazing sense of depth with tendrils of stars reaching out toward me. The center, while still a mass of unresolved stars has a subtle texture that suggests additional layers lying within. Conditions: Nice night. Damp -- lots of condensation. Just to get the scope aligned. Upped the magnification -- used 8mm eyepiece. At 13mm I could see four moons, two with averted vision. Used 8mm eyepiece finally. Hard to hold Saturn in field of view for very long. However, certainly worth the trouble. Five moons are visible, four stead and the fifth with averted vision. The rings show a definite gap between the inner and outer rings and faint bands can be seen on the planet, one above and one below the equator. The 13mm and 8mm make it appear that I'm seeing the south pole of Saturn and looking up at her rings. Tried using the #12 yellow filter. The division between rings might have been crisper, but I'm not sure. While using the 13mm a satellite moved rapidly through the field of view, West to East. 10:17 -- Saw two moving almost in parallel, side by side. First saw by Cor Caroli. As they passed through Draco's tail a third appeared between Alkaid and Cor Caroli. The third must have been in a lower orbit; it was catching up to the other two and faded first. Extremely faint companion directly above in eyepiece. 13mm to split. First light for the new Zhumell Z10 telescope. Used Saturn as a bright spot to dial in the Telrad and finder scope. Finder was pretty much dead on, Telrad needed some work. Easily resolved rings and Titan even with lowest power. Averted vision shows suggestion of ring lanes with 8mm eyepiece. Another bright spot to test the Telrad and finder. Color oscillates between blue and yellow -- when I deliberately defocus the smeared star appears yellow. Easily found by naked eye. Through 17mm eyepiece three attendant stars are seen. Not sure if these are companions or field stars. As usual a lovely cluster of jewels in the night sky. As I was watching a satellite too small for the naked eye rush passed East to West. Practically at the Zenith. Makes it a tough target for the Dob. Caught my first faint fuzzy. At least I think that I did. I saw two unresolved blurs of light, each with a brighter center. The lack of field stars made it difficult to focus properly when changing eyepieces. Occasionally I could make out a suggestion of spiral arms with averted vision, but I think I'm again guilty of wishful seeing. Found with 32mm, best view was with 13mm. Tried the 8mm, but view was too dark. Thought about trying to draw, but decided it wouldn't look that good. Should use a 2-per drawing sheet or make a new sheet for quick drawings that I can index off logs. When I was out gathering first light with my Zhumell Z10 I managed to find M51, the Whirlpool Galaxy. At least I'm pretty sure that I found it -- there weren't any field stars so it was difficult to get a good view. I could definitely see two linked patches of light, and from time to time I thought I could see a suggestion of spiral arms with averted vision. It's definitely a DSO that I'm going to go back to. 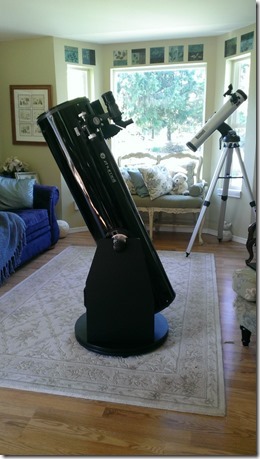 Bought a new telescope this week – it showed up today and I put it together in the afternoon. I’m looking forward to taking it outside this evening and trying it out. It’s a Zhumell Z10, a 10-inch Newtonian reflector on a Dobsonian mount. It’s got about 4 times the mirror area than the Northstar behind it, so I should be able to see deeper into the sky and see more of the faint fuzzies up there. Saturn is at opposition this week, so I went out to see what I could see. At first I tried to see Saturn by pointing my telescope at Arcturus. While Arcturus is a beautiful star, it certainly isn't Saturn. Saturn was about 26 degrees above the horizon -- quite low, but culmination is only 35 degrees so I wasn't losing too much. I found Saturn easily with the 17mm eyepiece. With averted vision I could glimpse Titan low and to the left of Saturn. The gaps between planet and rings was clear. Using the 8mm lens Titan came into view without using averted vision. after about 10 to 15 minutes I could start to see other faint speckles around Saturn with averted vision. Several of Saturn's moons are theoretically within range of the Northstar -- I might have been picking them out. The moon was 92% of full tonight. It washed out a great deal of the sky. In the sky around Saturn only the very brightest stars were visible. I put the NELM about 3.5, but that might be low. The Seven Sisters made a bright smudge on the sky -- even with my glasses off I could see them. Through binoculars they were bright and clear. I tried my 32mm lens in the Northstar. It brought out quite a lot of detail. I couldn't see any nebulosity tonight, but there were bright chains of stars through the cluster, the most striking at the top and bottom right of the eyepiece. Jupiter was the highlight of tonight's viewing. Through binoculars and the 32mm eyepiece the four Gallilean moons were quite clear. Io and Europa are close together tonight, Ganymede and Calisto are quite widely separated. The big treat for tonight came when I put the 13mm eyepiece in. For the first time I was able to see banding on Jupiter. There were two distinct bands on either side of Jupiter's equator. I tried using the 8mm eyepiece but could tease out no greater detail. The 80A filter did not seem to have any noticeable effect on contrast, but I tried it with the 8mm, so lack of light and a narrow field of view may have contributed. About the time that I was ready to come in Joe and Katie came home. I had them come out and take a look too -- and then had them haul equipment inside for me. Conditions: Cold, clouds came up in a hurry. The Cloudy Nights Binocular Universe suggested this object. I identified the Winter Triangle with no problems -- Sirius & Betelgeuse are old friends; Procyon was -- dare I say -- blindingly obvious. Unfortunately I wasn't able to get a firm fix on M50 before the clouds rolled in. Zoomed in might be a better description. At one point I saw what might have been a blur with two stars as described, but I could never find it again. Orion's nebula was quite clear tonight. Areas of nebulosity were visible between pairs of stars. The most striking feature weer a bright pair of stars at the top of the nebula, another bright pair halfway down, and then two more at the tip. The central bright points were the bright star-forming regions -- at least that's what it looks like when I compare what I saw to pictures. To my old eyes the Pliedes are a bright blur, but resolve into the Seven Sisters as soon as binoculars are brought to bear. The glow form the Sisters on the nearby dust is evident even to the naked eye, and readily apparent in binoculars, but I don't see any appreciable color to the glow. With binoculars I was only able to resolve one of Jupiter's moons tonight, though three should have been visible. The planet was easily outshining both the Pliedes and Aldebaran. This cluster caught my eye as I looked toward Jupiter. It was an impressive sight in binoculars -- I'm sure that a telescope would cut off too much of the cluster to make it better. Took our Australian exchange student out to show her Polaris. Since she's from the Southern Hemisphere, she's never seen the stars that are below the horizon in Sydney. Of course, Libby has the Southern Cross and I haven't seen that, so she has me there. Throughout the night we would get the occasional bright flash of a meteor from the Persied swarm. They ranged from single and double streaks crossing the sky to bright flashes with almost no streak. While Joe, Katie and I were starting to look for meteors a bright satellite passed overhead. It looked just like the ISS usually looks, so I checked online and sure enough there was a pass scheduled. Just as the ISS passed under Cassiopia it suddenly got very bright. We must have picked up a direct reflection of the sun off of a solar panel. Hercules was hiding the cluster this evening. I tried to find it for half an hour before finally tracking it down. It appears as a fuzzy patch of stars nicely framed by three bright stars. Found M13 using the 32mm eyepiece, then shifted to the 13mm. While the 13mm was useful, the best view was with the 17mm eyepiece. I tried to get a sight of M92, but wasn't able to find it. Again, I need to spend some time learning how to find stuff using "Turn Left." Stopped to say hello to my favorite set of double stars.